Crinum latifolium is one of the 180 Crinum species in the family Amaryllidaceae. Crinum comes from the greek word krinon, meaning lily, or, according to other sources, “trailing hair” or “comet tail”, depicting its long, drooping petals. It is known more for its medicinal properties than its ecology or for its bond with the water and earth. There are hardly any sources that would look at Crinum not as a resource to man but as another living being, because its uses for mankind are many. It has been used as a traditional herb in parts of Asia it is commonly found in, and given the status of “medicine for the king’s high palace”, or as the “royal female herb” (source), signifying the prostrate and the ovary. It is proven to be an excellent medicine against cancer of both. Its history dates far beyond its uses for our royal parts, however. And the story of the origin of Crinum latifolium begins in a marsh in East Africa, journeys through the depths of Earth’s innards spewing out – the humongous volcanoes millions of years ago that pillaged India, and rests here in the lap of Sahyadri. The Deccan Plateau of India was the result of one super-volcanic eruption in Earth’s history, and the hot lava covered an area of 500,000 sq. km. This occurred about 65 million years ago, in the Cretaceous-Tertiary era. A crater called Shiva crater along Mumbai was found to be created about the same time, as well as the Chicxulub crater in Mexico. At least one, or all, these events are theorized to be responsible for the K-T Extinction – the end of dinosaurs. Whether or not the Deccan volcano resulted in K-T extinction is still debated. This volcano spewed basalt eruptions, forming the Deccan Plateau, a primer to a unique ecosystem and for man to settle and come into his own. The conditions facing C. latifolium today are quite similar – prolonged dry season (8 months) and harsh, high temperatures during summer. The Crinums of the dryland or near-dryland regions are known to flower during rains, with some species in desert conditions known to flower “at rare intervals (when rains do occur)”. Possibly, C. latifolium, or its relative, migrated slowly across the continents to India’s basalt plains, and with the ingredient of monsoon, C. latifolium came into existence. Although C. latifolium is known to flower every year with the first monsoon shower hitting its underground bulb, it will be interesting to observe whether they flower if no rain strikes on the ground, or how many dry spells can it survive until flowering again in the next rain. In the Western Ghats, C. latifolium has colonized basalt rock regions wherever the rock is eroded. The basalt rock features of Sanjay Gandhi National Park are given quite a beautiful perspective when Crinum flowers. Its otherwise brown to black, formless structure, which bakes most of the year under the hard sun, is given a respite. It’s not so hard to believe that it is not only the rain that is responsible to give Crinum a chance to flower, and a chance for us to wonder at this fleeting wonder, but also the volcano of ages ago which resulted in formation of the basalt plains, eventually giving birth to Crinum latifolium. Scilla hyacinthina, now Ladebouria revoluta, is one of the neighbours of Crinum which, along with Chlorophytum tuberosum, spills the otherwise monochrome landscape with its purple aura. While Crinum stands tall on its peduncle, Ladebouria dwells closer to the ground. The same habitat is also shared by other ephemerals – insects, which are as attractive as the crown of Crinum. Some of the Tiger Beetles that share the habitat with Crinum are Cicindela parvimaculata, and Cicindela azureocincta. Although the larval habitat preference of these beetles is unknown, they probably also nests near the bulb of Crinum, in a burrow in one of the crevices in basalt rocks where the soil is deep enough, while the adults roam the basalt rock surface in search of prey. Crinum latifolium belongs to a family of those ephemerals which bring delight to those who search for them, but this narrow window of barely a few weeks is far more important in order to survive for several organisms. With the journey in back of my mind, I love to sit and gaze at these flowers, wondering that this slow-paced – rather still – sentient being was able to travel, evolve, and grow right here, in front of me. 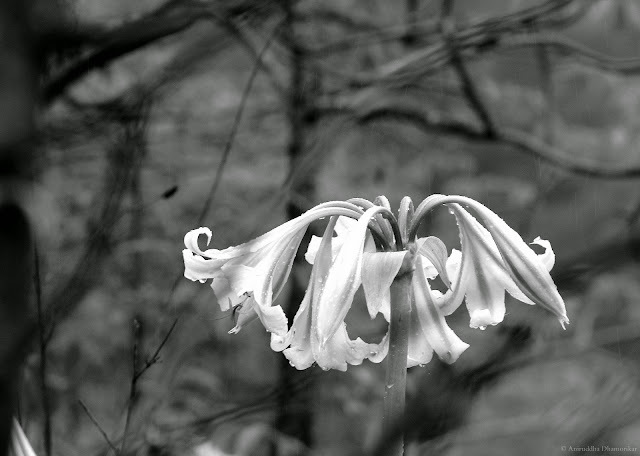 As you look at the still, drooping flowers of Crinum, you may imagine that time has stopped still. In reality, everything is racing to survive against time. Everyone wants to make the best out of it. Man, on the other hand, has cultivated C. latifolium extensively to extract the medicinal properties, so fields of this plant are not uncommon to come by in south Asia. The exploitation of the plant however is more painful when you see them hacked and laid out to decay under the rain for no apparent reason. When we went to explore the enigmatic Crinum, we were welcomed first by flowers broken and thrown along the entire trail. C. latifolium is neither rare nor threatened, but the sight of this senseless destruction made me ponder: how long will Crinum’s unconditional bond with water and earth remain, with mankind to compete with? Sahyadrica (earlier Wanderer’s Eye) turned five today. It was on this day that I sat and opened a blog to blabber about my exploits in nature. I continue to do it to this day, and I thank each and every one of you for being a patient reader, gazer, and advisor. Thank you! The genesis of Wanderer’s Eye was to bring the monsoonal diversity to the front, but it started one year earlier when I created an “offline” report, as I put it in the first post. I get a laugh reading through it, so I thought I should share. The Monsoon Trails 2007 report is now online. Congrats to you and Happy 5th Birthday to your blog. May you continue writing such wonderful and poetic posts for the next 50 years. I simply love reading them. You have a bright future in writing. Just wanted to ask you two things. 1)What are these flowers locally called? and 2) India is a huge country with varied physiography and flora and fauna, so why don't you cover other forests of India outside Maharashtra? Thank you, you are too kind. Locally they are called by several names, including Gandanikanda. I chose to omit common and local names often because they are sometimes vague and without concrete evidence. As for your second question, work does not allow me to travel out of Maharashtra, but it will change in the near future! Thank you once again! Another refreshing article, Wonderfully written! I hope to here from you about the marvelous diversity that Madhya Pradesh has. Keep it up, aniruddha! We all will miss you here in Mahrashtra for sure. All the Best & enjoy your work in MP!